My oldest son is really into little figures and especially ones from LEGO. When I heard you could make your own LEGO Minifigure Family card, I knew my kids would LOVE the chance to build their own figure. It made a great after lunch but before nap activity for the whole family! After lunch, we cleared off the table and I set up chairs around my laptop. 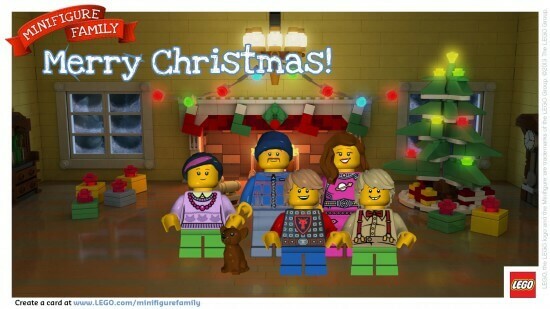 As soon as I pulled up the LEGO Minifigure Family card site, they were out of their seats trying to scroll the screen with their fingers. I added all of our family members, including our pup. My plan was to let each family member design their own figure, but that only half worked. My daughter took over the outfit selection for everyone. As you can see, she has an interesting taste in style for a four year old. She loved getting to pick out all the features. You can customize every aspect of your figure. It’s so fun! You get to customize the head, torso, and legs. There are so many different options!! You can change the color, facial expressions, add crazy hair, a hat, or even a chicken hat. It took some convincing for my daughter to not make our youngest into a chicken. There are 50 different torso options and 46 leg choices. The possibilities are limitless! After you create your family, your add them to a scene. There are several different ones to choose from. Everyone agreed they wanted the Christmas tree scene, so that made it easy. Then you can move each family figure around in the scene. I had everyone placed just right, when my daughter insisted that she couldn’t stand next to her youngest brother because he would pull her hair. When I moved her next to her other brother, she said he’d pull her hair too. She had to stand next to her Daddy. She obviously really enjoyed this activity. Even if your not that into LEGO’s yet, this is still a fun activitiy for the whole family. Everyone loved trying out all the different hairstyles with some of the fun outfits. We will definitely be coming back to this site.